Samsung validated most of the rumors that has spread across the tech world about the next Galaxy smartphone by unveiling a slimmer and sleeker Samsung Galaxy S4 last Thursday during the Samsung Unpacked 2013 event held in New York’s Times Square. 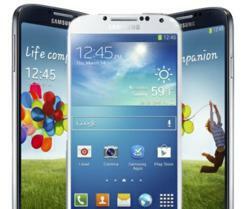 The Samsung Galaxy S4 featured many of the rumored specs that had been circulating the tech world since late last year. The Korean electronics giant indeed released a Samsung Galaxy smartphone with a bigger 4.99 inches screen with 1080x1920 pixel resolution at 441 pixels per inch. The Super AMOLED screen is protected with Corning Gorilla Glass 3 and is a bit bigger by 0.19 inches in contrast to its predecessor, Samsung Galaxy S3. In terms of hardware specs, the new Galaxy indeed, runs on the latest Android 4.2.2 Jelly Bean operating system. What’s surprising is that Samsung upped the CPU specs by bringing in a 1.9 GHz Quad-Core processor as well as a 1.6 GHz “Octa-Core” processor. This, many tech experts noted, is a stellar feat that will surely keep competitors on their toes. It also has a PowerVR SGX 544MP GPU chip to support the massive display’s 16M colors. The smartphone includes a 2 GB RAM and is available on three internal memory capacities: 16 GB, 32 GB, and 64 GB. Of course, the S4 also has expandable memory of up to 64 GB with the use of MicroSD. Many tech bloggers also predicted that Samsung will try to up its game in terms of camera specs by baking in a camera that’s as good as a real point and shoot at the back of their latest Samsung Galaxy smartphone. And though many thought these could be quite impossible to achieve, Samsung wowed everyone during the press conference by unveiling a Samsung Galaxy S4 with a 13 MP rear camera at 4128x3096 pixels and a 2 MP front camera that allows simultaneous photo taking, face detection, image stabilization and touch focus. The photo taking interface was also improved on the Galaxy S4 to mimic that of the Samsung Galaxy Camera which was released late last year. This, according to the company’s representatives, was done to make it easier for users to familiarize themselves with the camera settings, a move that may signal another wave of Galaxy Camera releases this year. Other great features included in the Samsung Galaxy S4 are: S-Voice, Android’s own version of Siri (we really can’t help but refer to its toughest competition, Apple); DropBox native app, which allows users to easily extend their smartphone’s memory by using cloud storage services; and Swype predictive text input, which helps make typing more accurate and stress-free by allowing users to swipe through the letters on the virtual keyboard instead of tapping it. Meanwhile, a lot of tech blogs also came up with a prediction that the Korean tech giant will include eye scrolling features on the Samsung Galaxy S4 months before the actual release that will allow users to manipulate their device using their eyes. The said technology has been showcased in CES 2013 on January. However, the Smart Scrolling feature took on a different note as compared to what most tech experts thought it would be. While the tech giant kept the Smart Stay feature which was previously in the Galaxy S3, they also added functions which allow users to scroll up and down by tilting the phone (Samsung Smart Scroll) or waving to it (Air Gesture). All in all, the Samsung Galaxy S4 proved to be an impressive device in terms of specs and features. But eager smartphone consumers would need to wait for a few more weeks before they get their hands on this device as it will be officially released in the market on April 2013. In the meantime, smartphone reselling companies like Cash for Smartphones are now getting ready for the influx of old and used devices at the onset of Samsung Galaxy S4’s release as these big product releases often signal an – increase in buy backs and trade ins . For tech enthusiasts who wish to own the new Galaxy S4.